Life After Two Losses: How Are You? What's wrong? How Are You? What's wrong? So on another note. All my blood testing came back for the clotting disorder that my OB thought I might have. Maybe the reason that my placenta gave out on Logan. So it turns out I dont have a clotting disorder, everything came back fine. So now what? We are back at square one. Logan's autopsy came back fine, he was perfect inside and out. And although my placenta seemed to have scarring we cant explain why. We dont know why it gave out and so far it doesnt sound like we will ever know. So next time is going to be just as scary even more so. Its going to be another scary 9 months. I'm going to be on edge everyday. It'll be amazing if I dont have a nervous breakdown. I am thinking about going to a specialist maybe there is something new that my OB doesnt know about. Something, anything. I NEED ANSWERS!! I am so frustrated, so mad, sad. I am numb. I dont even want to move the bassinet, or my hospital suitcase or the basket of clothes I was getting ready to wash, or unpack the diaper bag. If I move any of those things it'll be real, it'll be over. And I am not ready for that. Its been a month but at this point I feel like I'll never be ready. I am so tired of being sad, of crying. But once again this is my life. And I have to figure out how to live it from day to day. I'm sorry I missed the one month yesterday, but know you were on my mind. The quilt is beautiful. I'm so glad your mom continued with it and is making one for Emma too. I wrote a similar post about "How are you?" It drove me crazy for the first 3 months that people would even ask that. Really, do you really want to know? That's what ran through my head. Most of them didn't want to know though. It's just something they say with "hello", but that doesn't excuse them asking such a thing considering the circumstances. After I actually started answering the question with "Sh*tty" people stopped asking. Guess the truth hurts. I'm sorry about the findings from your OB. I can't imagine the frustration. I think it's a good idea to get a few more opinions, though. I'll ask all my docs if you want. You're welcome for the Pink rose. We have to draw our strength from eachother...I'll carry you when you're down and I know you'll be there for me. And know that YOU amaze me. Manda I am so sorry everything is so rough right now. I know when we lost Hazel I really didn't do much (other than sit on the couch and watch movies) for a few months. There were a few nights I went out but not very many at all....I was just too sad and going out being happy was not something I could do because I was not happy. I say yes absolutely start to see a specialist. After two losses like this you should see a specialist who can draw their own conclusions and try to figure this out. My regular OB could not conclude why we lost Hazel but the specialist found out right away. I LOVE my specialist and it is a totally different and better experience than any OB I have ever been to. Amanda, I am so sorry for your losses. Emma and Logan are such beautiful and perfect babies. I'm sorry your heart aches the way it does. I wish there was something I could do or say to ease that pain, but I have no words. The quilt is beautiful, and I'm, glad your mother is making one for Emma as well- so very special. And yes, get a second opinion, or a third. You need answers. They're out there, you just need to find them. You've been on mind alot Manda. I know you're not okay and that you won't be for a very long time. I wish that I could take it all away and place your beautiful babies back in your arms. I wanted to let you know that Logan's quilt is so very beautiful. Your mother is incredibly talented. I'll be looking forward to seeing Emma's. I love you so much hon. Your children have left their little footprints on my heart forever. Manda - I think of you daily. 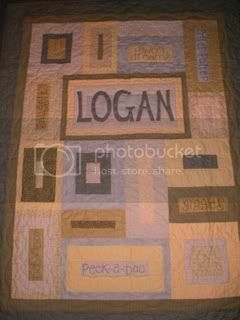 The quilt your mom made for Logan is just beautiful. I'm in tears reading what you wrote following the pic of his quilt. I was just thinking the same things... about Soren never seeing my face, never seeing the little print of 2 giraffes in love that we bought for his nursery - our first piece of real art was for him. I look into the sky and the clouds are radiant, shining in the sun, and my son will never see that radiance. Never feel the heat of the sun on his back. Amanda- I am so sorry you've lost you second baby now too. This is just too terrible for words. Are you seeing a highrisk OB? My doc's practice is under the engimatic "maternal fetal medicine" that may be a key word or something. 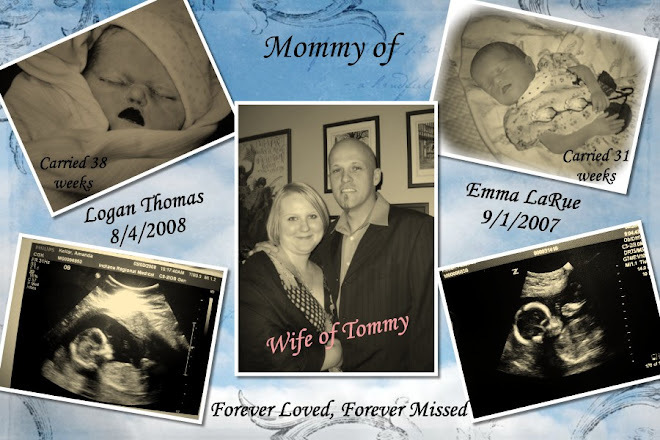 I remember being weeks out from losing Caden and people asking what was wrong - I looked at them like they were simple and said "my baby is dead". Kim used to ask too and I felt like it should have been obvious. If you think a specialist might find something, or might ease your mind just a little - DO IT. You are in my heart always.